Posted on 8/1/2011, 10:41 am, by sweets4ever, under General Projects. We’ve spent so much time outdoors this season, we thought it was time to give some crafting time to our indoor spaces as well! Check out some of these projects to give new life to your work, study and crafting spaces! 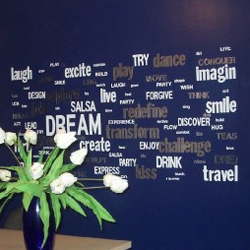 This word wall created by scrills is not only a fun and easy way to decorate, but it’s an opportunity to create inspiration in your office space! 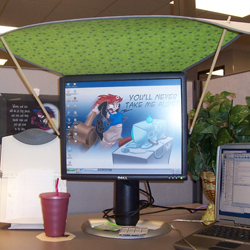 Tired of the super bright lights and boring decor in your cubicle? Do not fear! Create a cubicle cabana like SewPixie. She created this fabric office cabana to diffuse the bright lights from above her desk. 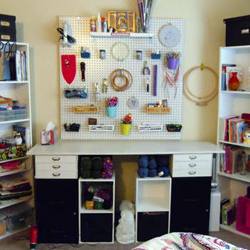 An oldie, but a goody, pegboard organization is such a lifesaver in a craft space! Suzie Penguin designed her craft space around a peg board and desk built from file cabinets, paper holders and wood.